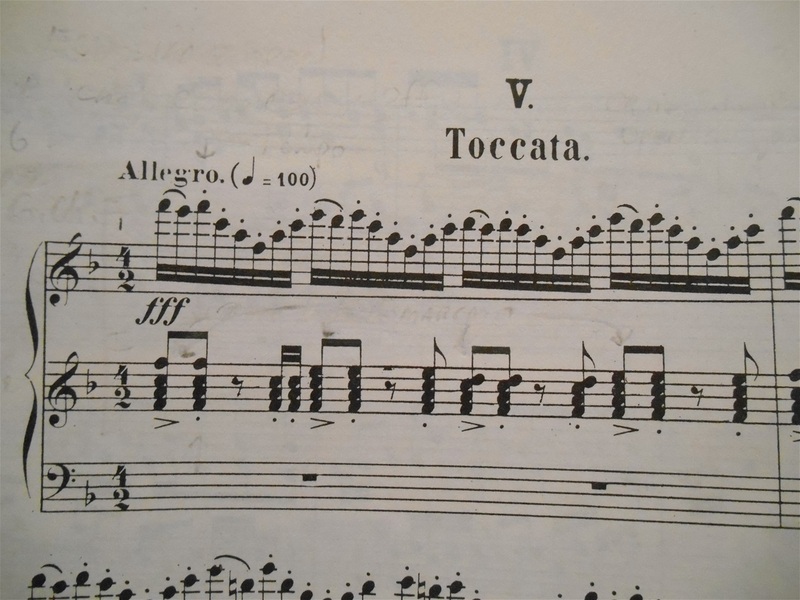 There are many players who perform this piece, in its entirety, with a uniform legato touch, ignoring the accents and articulation marked in the score and with little, if any, nuancing of the tempo. Some of the most famous organists in the world have recorded it like this, and most audiences today are accustomed to expect it performed no other way. 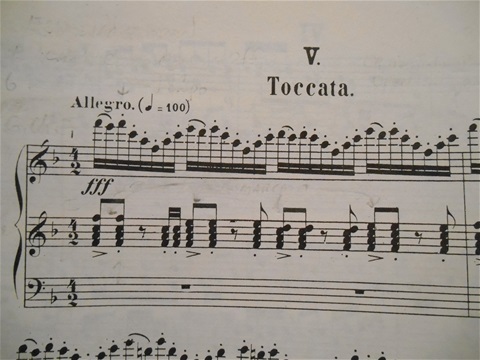 By taking the time to place a slur over the first 3 of the moving arpeggiated notes, staccato dots (See blog, Touch, Part I) over the remainder, and mark all succeeding moving notes "sempre staccato," legato touch for the arpeggiated notes obviously was not what the composer intended. The remarkable gold-standard recording of this work made by Jonathan Scott on the Cavaille-Coll organ of Manchester Town Hall [See menu bar, Videos] observes these indications carefully and is a brilliant performance which will repay careful study. The left hand chord falling on each half note beat (photo) is marked in the score with an accent (>). This accent can be made using 2 different means: 1) by altering this chord's duration slightly, holding it very slightly longer, just long enough to be noticed by the ear, without a change in tempo (this type of accent is called an agogic accent), or 2) by holding the chord back a barely appreciable trifle before it's struck. The next left hand chord which follows, being marked staccato, is played on the beat and held exactly half its written value. These two left hand chords are then repeated on every succeeding half note beat, forming a series of repeating accented/staccato chord pairs throughout the rest of the piece. Each succeeding chord pair is executed exactly the same way. Care should be taken to observe these accents but not hold on to the first chord of each pair too long, which creates a marcato touch. Holding on too long on every half note beat this way runs the risk of making the listener "sea sick." The idea is to give the first chord of each pair a very subtle accent that's not noticed on the second chord, but with definite, audible separations between them. This automatically sets certain technical bounds to speed. Some very capable organists have admitted that they've worked this piece for years and never could get past the first page (photo). Admittedly, this work on paper looks a little horrific with its torrent of black noteheads that never lets up from beginning to end through 10 daring pages. The secrets, if secrets they may be called, to developing a convincing interpretation and the requisite endurance for making one's way through this music are 1) first, start with a balanced bench position (see Balance in Organ Playing, I, II, III, What About Bench Position), 2) settle on a good starting tempo and how it will be nuanced (see Part I), 3) practice the staccato notes and chords very slowly at first (this may be done at the piano, always being careful to stop at the first sign of strain or fatigue), getting them to first sound at exactly half their written value (see Touch, I) before bringing the tempo up to speed, 4) raise and lower the wrists as you play to keep tension from setting in (see Touch, IV), and 5) develop flexibility in the bridge of the hand, which allows more finger movement from the knuckle down (see Touch, IV, Exercises, I). You'll have to work at it some, but this approach is the one that pays big dividends. The organist who pays heed to these 5 things, and does them well, is on track to developing a very fine rendition of this famous work and can be expected to finish the last page fresh as a daisy without fatigue. There's a conspicuous stretch of a major 10th interval between middle C4 and E5 in the reiterated left hand chords on the last 2 quarter beats in measure 8, which is difficult even for players with average size hands to manage. In this passage we find a root position C7 chord written in open harmony. For many performers this stretch is impossible. This issue may be addressed either by 1) dropping the bottom C from the left hand and placing it an octave higher, or by 2) dropping the top E in the left hand and replacing it with the C below it, thus preserving in either case a 4-note C7 chord within the stretch of an octave. The first solution seems preferable harmonically, since it includes all 4 notes of the chord. There is no shame in "changing the manuscript mentally" like this when the alternative is not to perform the piece in public at all. Widor calls for diminuendos in the middle of the piece, and near the end, by closing the swell shoe, and these dynamic nuances should be observed. We sometimes observe that the final diminuendo beginning on measure 65 is ignored by the performer, as if the instrument for which Widor wrote had no enclosed division and only one manual, but this runs contrary to the composer's intention and the type of instrument he knew. Widor cleverly wrote this diminuendo into the music in order to widen the crescendo leading into the final chords. He realized that, for those final, crushing chords to have their greatest dynamic impact, they needed to be preceded by a noticeable reduction in volume. The way the composer notated this reduction was to assign the left hand part to a secondary enclosed division and to gradually close its swell shades. This tends to block the organist's view of the right hand. We sometimes observe this closing passage performed very effectively and entirely on the Great manual with crossed hands. This keeps both hands fully visible and would be preferrable if the instrument is equipped with toe studs controlling general combos which could be activated to reduce the sound on the Great as this passage proceeds. The sound could be increased the same way as the closing chords are approached. Some practice on the instrument at hand will suggest which is best, which gives rise to the familiar adage among organists: "Once you can tie your arms into a pretzel and your legs into a knot, you've got the Toccata from Widor 5 under control." These considerations, and there are others, should be sufficient to show that this music, obviously, cannot be interpreted with a Baroque mind set. The composer of the Art of Fugue would be among the first to promote the idea that interpreters at the organ need to train themselves to approach the entire repertoire with interest, being mindful to adapt one's playing to all existing styles of music. Sebastian Bach, even in his maturity, made detailed copies of all good organ music he could get his hands on, regardless of country of origin, and made it his business to learn how it was to be peformed. He happened to be forced, through an accident of birth, to wander through the closing years of the 17th century and the first half of the 18th century. What resulted, in his case, beginning around 1700, was fifty years of white hot creativity. This, as it turned out, was most fortuitous because it gave the world, among other things, the finest organ fugues in existence. And, it's probably safe to conclude that there are certain pieces of his that he would not have conceived any differently if he were acquainted with modern organs. But, if this man had lived a century and a half later, it's no stretch to say that Bach the organist, with his almost superhuman invention, would have developed his touch at the piano rather than the clavichord (see Touch, Part II), would have written some of the most beautiful Romantic organ music imaginable, and would have performed this music idiomatically, i.e. consistent with the prevailing practices of the time. Bach the total musician would have been an avid exponent of the 19th century orchestral organ and the additional possibilities it presents. He would be among the first to say that just because another organ is built in a different style from previous centuries does not mean that it's inferior in any way. He'd also be among the first to admit that shining Romantic organ music through a Baroque prism can create just as much aberration as Romanticizing Baroque organ music.